So we had a ridiculous amount of fun on Sunday at my local W9 Dry Good Store. Coffee, Ice Cream and a lot of playing with hoops. After the performance everyone had a go at the hoops. There were parents teaching their kids and even more kids teaching their parents! Was such a fun day! Taking our company name Happy Healthy Hoops literally, I've decided to write about five things that have inspired me this week. 1. Yesterday my friend won the Peoples Book Prize!!! His book You're Gone to Far This Time Sir won best non-fiction. Years ago when waiting in the lobby to be interviewed for an accounting job at a property firm, Danny Bent, a stranger at the time, wandered past warmly welcoming me to the office and wishing me luck. It instantly made me want the job more. The staff were so friendly, I got the job and loved working there. Since then I've enjoyed seeing Danny's adventures on FB. He always seems to be up to something but I seemed to have missed the fact that he wrote a book!!! Watching his acceptance speck yesterday I learnt that Danny had dyslexia and his journey to becoming a writer had been just as windy as my journey from Accountant to Hula Hooper. I can't wait to read it! 2. Gemma Smailes one of our Kentish Town HoopFit Students is going to jump out of a plane this weekend to raise money for Canine Partners for Independence. Best of luck Gemma! 3. This Photo from Morning Gloryville London just makes me happy. 4. I spoke to my Dad yesterday, he is in hospital for a few days having some check ups. His health is complicated having suffered from Parkinson's Disease for 17 years and breaking his knee in every way possible. But the first thing he says to me is 'Bree, being in this hospital makes me realise how lucky I am'. 5. Anna Lisa one of my students from Bannatynes has been hooping for a couple of months. It's been a slow process for Anna Lisa but this week something clicked and we managed 3 hoops yesterday! Perseverance, patience and practice. Did you spot me?? I was only on for a split second but I was there in the opening sequence. If you want to watch it go to ITV Player. In February on Tube Strike Day guess who was up early hauling her hoops all the way down to the ITV studios in Wimbledon. It was one of those days...I had a cold, due to the tube strike it took me 3 hours to get there, the filming was out doors and it rained all day BUT the atmosphere when I got there was spectacular! In typical british style the rain put no one off, we soldiered on. I met some fabulous people including this chap, you might recognise him?? He announced the birth of Prince George! I didn't manage to get a photo with Ant and Dec (because I had to run off to teach HoopFit at Warwick Avenue) but I did catch them having a little chuckle at me as I was bouncing up and down hoops in hand trying to keep warm. In my head we are now BFF. If you watch very carefully I'm in a couple of shots but it's a bit like playing Where's Wally. It was at the very end to the day, that someone said can you just jump in this window for a quick shot and voila! This is the one that was used. I feel very privileged that I was asked to be on the show even for a second and I think perhaps next year I should actually audition??!!! People always ask me in class why I started hula hooping? And honestly it was a bit random, some people might even call it fate. Yes even me….it was totally fate, I was meant to find this circular piece of plastic and it was meant to change my life! To start with I went to a circus in London and while all the other performances entertained me, the hula hooper had me mesmerised. I couldn’t take my eyes off her, it really was a magical moment for me. I still don't know who the girl was but when I went home that night, I lay awake imagining ‘what it would be like to be able to move like that’. I was not a dancer, I had never hooped but for some reason that performance captivated me and I fantasised about it for hours. I had never thought of hula hooping as exercise but a few weeks later I was bored with the gym (as usual) and decided to google ‘fun fitness classes in London’. Guess what I found… of course you already know, hula hooping!! It took me a while but I finally found a class!! I emailed my friends, most of which said it was the most random email I had ever sent but one friend Gina said yes! Gina was a natural, which is the worst thing that can happen in your first hoop class!!! You go with a friend thinking, ‘it doesn't matter if I am rubbish, because we will both be rubbish’. My bubble was burst, Gina’s hoop spun steadily around her waist whilst mine spent most of the time on the ground. Not to mention the loud bang my hoop made when it his the wood floor, cringe!!! The teacher Anna Hulagan, eventually noticed me struggling and suggested I ‘face the wall’. Yes, it was like being the class dunce and I was a little distressed by the suggestion but, it turned out Anna had hit the nail on the head, with out being distracted by what everyone else was doing I was finally able to keep the hoop up. Something really clicked for me in that class, the obsession was immediate. I wasn't very good but I kept trying because it was worth it for those moments when I finally got it right. I am not a natural but I work hard, really hard. When Sammi and Nicole first came to a HoopFit class together it made me realise how beneficial it was to have a hoop buddy so I decided to interview them to find out more and here it is! Sammi: I have known Nic’s husband since we were 16 so we met through him. Nicole: When I first started going out with my husband, he took me to meet two friends of his for drinks; queue Sammi and her boyfriend. This was during a world cup match and we bonded over our lack of interest in football! And I am guessing you then bonded over hooping? How long have you been hooping for? Sammi: Around three and a half yearsNicole: I dipped my toe in the water in 2006, but I’ve been properly doing it for fun on and off since 2010. What inspired you to start Hooping? Did you start together? Sammi: We had both been interested in it without mentioning it to each other until New Years Eve one year, when I said I wanted to try and it turned out Nic did do. We went on the hunt for a workshop to go to one weekend and the rest is history! Sammi: Hooping is so much fun! There is always something new to learn and so many different people to learn it from. 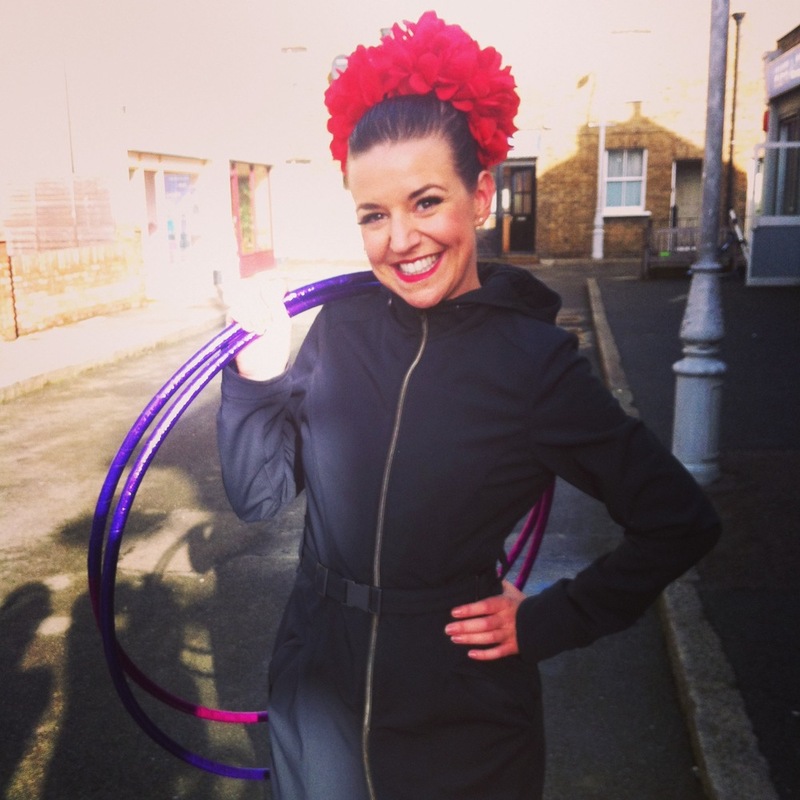 Especially being part of the London Hula Hoopers group you can always find hoop happenings to suit you. Nicole: I’ve never been into sports and have had trouble keeping a steady workout routine. This feels like I’m just playing with a toy, I just pick it up when I’m bored or distracting myself from things. I don’t even really think about it as exercising- it’s just a nice bonus! There is also a bit of it being a puzzle learning new moves. I love puzzles and I get this buzz when I’m struggling to ‘get’ a trick and suddenly it clicks and works. Oh, that’s the best feeling! What is the best thing about having a friend that hoops? Sammi: You always have someone close by that is happy to come to the park in any weather to hoop away! Nicole: It’s great motivation to get to classes and having someone to talk to about it is awesome. Sammi: I love the two hoop weave, could do it for hours! Nicole: Hahaha! Vortex??? Even if it is our in-joke that it’s the only move we know how to do. (Not anymore, luckily!) I can’t knock it; it’s fun, it looks impressive, and it will always have a special place in my heart for the as the first trick I mastered. What is your favourite hoop trick that Nicole can do? Sammi: Chest hooping! This still eludes me! And Nicole dose Sammi have a trick which still alludes you? Nicole: Sammi’s ninja ambidextrous skills with picking up tricks with the mini-hoops. I’m useless with my left hand, so I’m always in awe when she can start whirling the mini ones around in both hands like it’s nothing. Just need to practice more with it though and I can get there! What has changed for you since you started hooping? 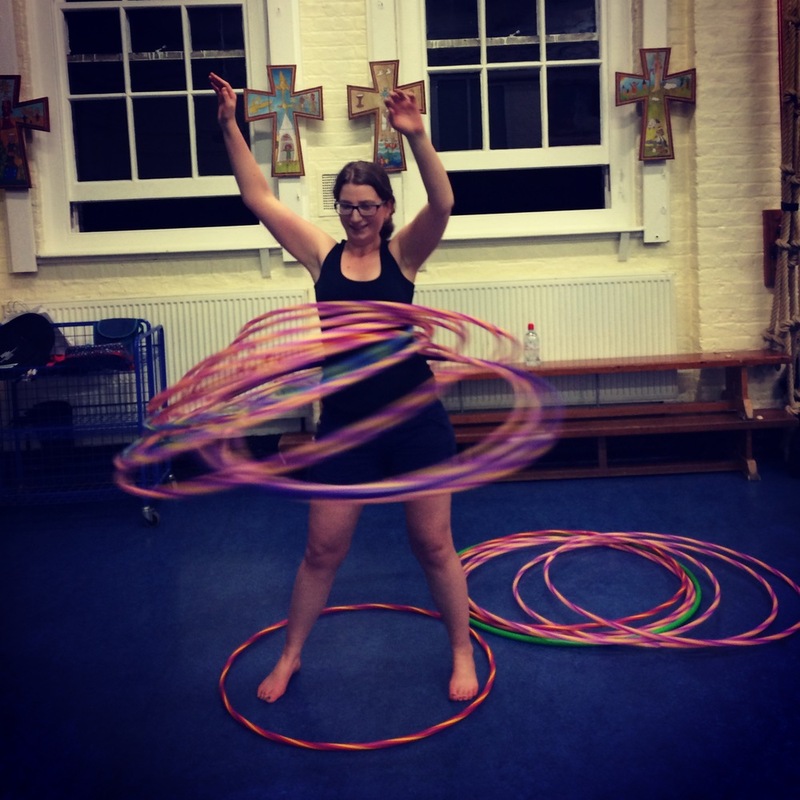 Sammi: Before moving to London five years ago I didn’t know many people here and hooping is a great excuse to get out and meet new people as well as great exercise! Nicole: I get anxious very easily and I find after I play with the hoop for even just 10 minutes it helps me to de-stress and collect my thoughts. It’s made me a bit more carefree and reminded me it’s OK to have fun as an adult- it’s absolutely fine to go to the park and play, and it makes people walking by smile. Bonus! Is there anything else you would like to tell the world about your hooping experience? Sammi: Having a hoop buddy really encourages you to keep it up (as if you need help with that) and you bounce of each other. You can help each other with those tricks that you just can’t seem to get! It also helps to have two pairs of eyes looking out for hooping events going on so you don’t miss anything! Nicole: I’m so glad I gave it a second go! It definitely helped to have a friend interested in it as well. Sammi is a great hoop buddy to have because she’s always up for a spin in the park in the summer and we keep each other motivated to attend classes when we can. We’re both a bit obsessed with making sure our future dream homes will suitable for our hooping needs; large front room -or just a hooping room, high ceilings, big garden… move over Barbie Dream House! So who are your hoop buddies? And how do they inspire and motivate you to keep hooping?